A fashion trend that goes straight to the hips: peplum. It sounds like a bad idea - clothes with an extra piece of fabric around the area of our bodies which we are most sensitive: our hips! But actually, with the right fit, this trend can be really flattering for women. We are seeing a flashback to the '80s, with the hip-accentuating peplum skirts, dresses and tops back in style. The peplum style first become popular as a silhouette to accentuate an hourglass figure, as they whittle down the waist and accent the hips. But what if you're not model-skinny, how will this trend look on the average women? What it does is define your shape, making your waist look smaller and can ultimately be quite complimentary. It looks like peplum is here to stay - it has even made its way to the bridal couture collections as we showed you the other day from Bridal Fashion Week Spring 2013. 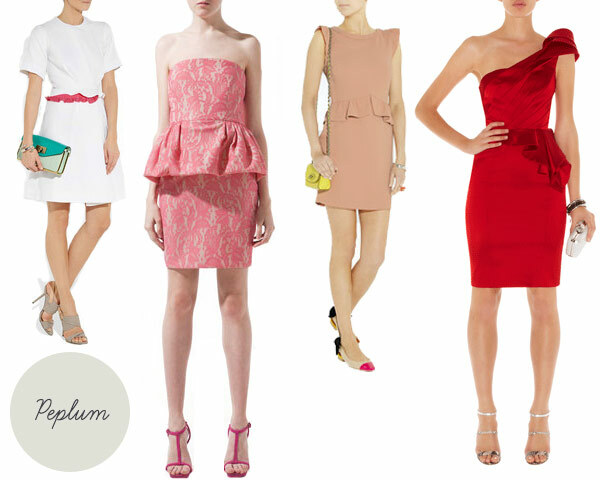 When choosing your perfect peplum, keep in mind there are two versions: fitted and flared. If you want to show off an hourglass figure, choose a fitted peplum. Flared, on the other hand, will add curves to your hips and is the perfect choice for boy-shaped bodies. Choose a form-fitting jacket with a subtle flair, accessorised with a skinny belt to further clinch your waist. Wear for work with a pencil skirt and pumps. Add a peplum-adorned dress to your wardrobe for the perfect outfit for cocktail hour. Or wear a white peplum shirt with a tight printed skirt, like our last image, for a girl's night out - stunning right?